+ A paper note which had a gradient of mauve, with a distinct black overprint. + The first polymer issue, which can be recognised for its distinct mauve colouration and numeral font, was first issued in pale mauve (1992). It was soon discovered that ultra-violet light degraded the ink bond and that a note in circulation for any moderate period of time could have elements scratched off with a fingernail, for example. + In 1995, a second polymer issue was created, distinguishable by its deeper shade and different font for the numeral. + A federation commemorative 5 dollar note was issued in 2001 for that year only. 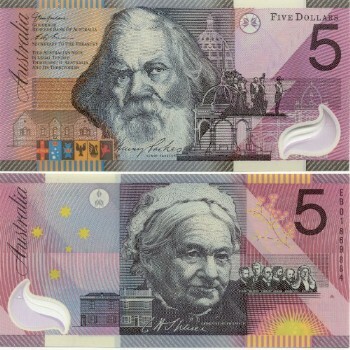 Notes featured Sir Henry Parkes on the obverse and Catherine Helen Spence on the reverse. Since the start of issuance there have been sixteen signature combinations, of which the 1967 issue is of the greatest value, issued for two years only; and the 1990 Fraser/Higgens being issued for less than a year. From 1967 to 1974, the main title identifying the country was "Commonwealth of Australia" and there were 195,504,000 notes issued in its life. This was subsequently changed to "Australia" until the end of the issuance of paper currency for this denomination in 1992 with 978,068,318 of these notes being issued. According to Reserve Bank statistics, at the end of June 2015 there was a net value of $823 million in Australian 5 dollar notes in circulation, with a 1% cash value of all issued currency. Actual banknotes in circulation account for 12% of all denominations, or 116 million notes. In 2014/15 around 78 counterfeit 5 Australian dollar banknotes, with a nominal value of $390, were detected in circulation. + The clear window which contains a stylised gum flower printed in it (and can be seen from either side). +When the Australian 5 dollar note is held up to the light, a seven pointed star within a circle is formed by four points on one side of the banknote combining perfectly with three points on the other. +When the banknote is held up to the light also, an image of the Australian Coat of Arms can be seen under other printing. +The words 'FIVE DOLLARS' are microprinted and can be seen with the aid of a magnifying glass. +Slightly raised printing that can be felt with the fingers is used for the portraits and other major design elements. +Intricate multi-coloured fine-line patterns and images appear on each side. + Under ultra-violet light, the serial number fluoresces and a square patch becomes visible on the back of the banknote. + The clear window contains embossing of the number '5'. Part of the window has a mauve appearance. + Slightly raised printing can be felt by running a finger or fingernail across the main design elements, such as the portraits, the denomination numeral and the word Australia. + The words of Parkes' Tenterfield speech (front) and 'Advance Australia Fair' (back) are reproduced in microprint and can be read with the aid of a magnifying glass. + When the note is held to the light, a seven pointed star within a circle is formed by four points on one side of the banknote combining perfectly with three points on the other side. + A hidden '5' below the small printed triangle in the bottom right hand corner of the back of the note is revealed when that area of the banknote is viewed through the mauve coloured area of the clear window. Fold the banknote so that the triangle in the window is on top of, and in direct contact with, the printed triangle. To accentuate the effect, move the triangle in the window around the printed triangle. 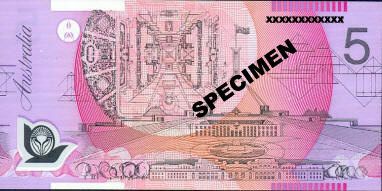 + Intricate, multi-coloured, fine-line patterns and images appear on each side of the banknote. + The serial number of each banknote is printed vertically on the back of the banknote. Under ultraviolet light the serial number fluoresces. + Under ultraviolet light on the back of the banknote, the stars of the Southern Cross, the sunburst, the yellow orientation bars at the top and bottom of the banknote, and the wattle flowers fluoresce. Also, a spray of wattle leaves and the numeral '5', that are normally not visible, become visible under ultraviolet light.